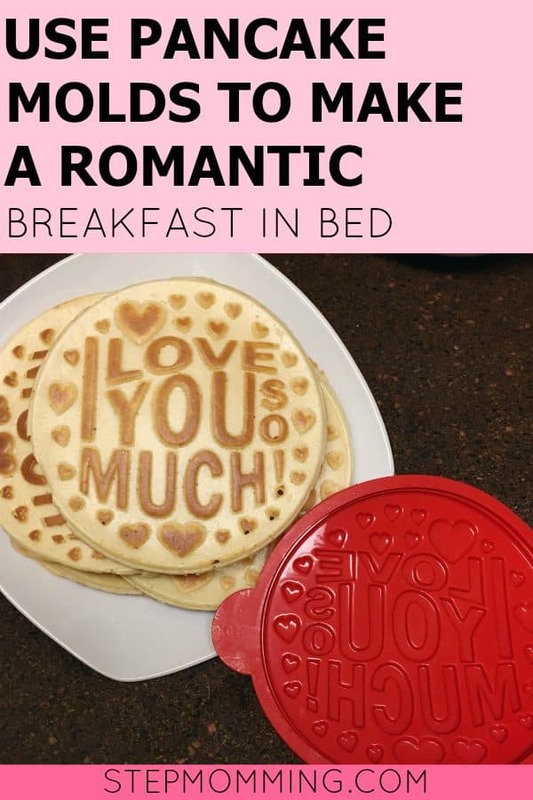 Have you ever heard of Pancake Presents? I hadn’t either until Amanda from Pancake Presents messaged me on Twitter. We started chatting and I quickly learned that she worked with a company that sold pancake molds. Now, I love pancakes. Cooking them with my oldest daughter, K, is one of the most fun ways to spend Saturday mornings. But I had never used pancake molds before! This post may contain affiliate links. For more information, read our disclosure & policies. Thanks for your support! Wednesday night, James and I were trying to think of what to make for dinner. 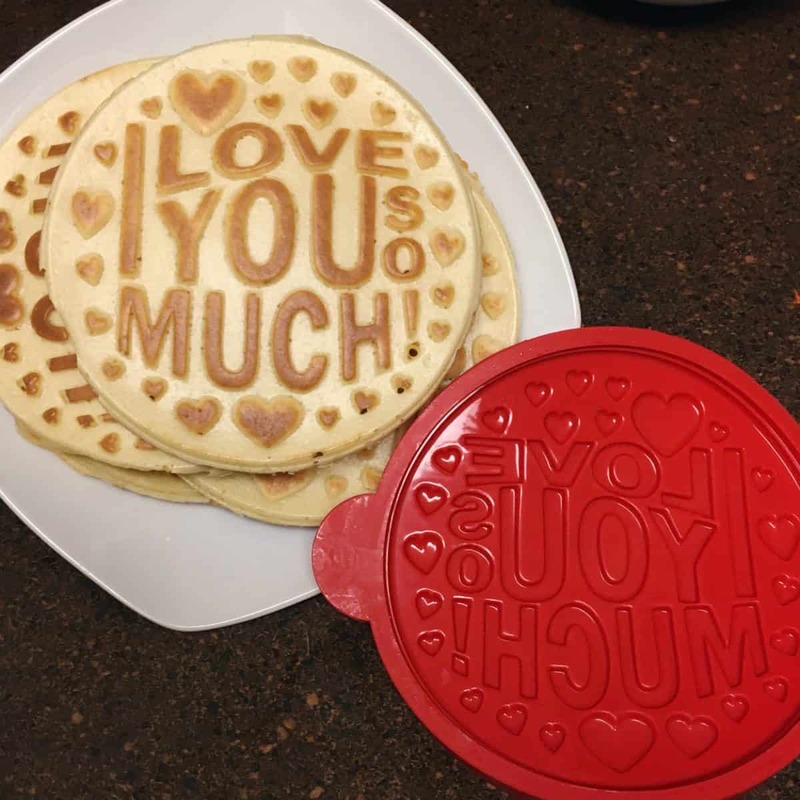 When I told him I had these new pancake molds I wanted to try out, he was all for it. 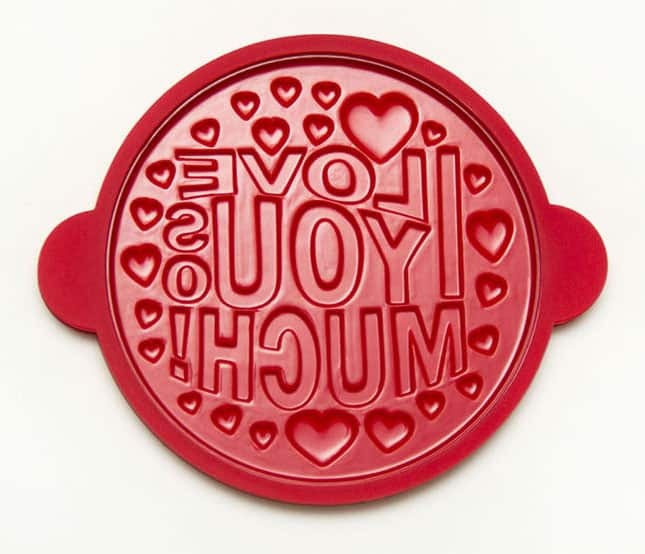 We had the “I Love You So Much” mold, and the “Good Morning” mold and decided to try both. I just LOVE the “I Love You So Much” one, it’s absolutely PERFECT to get in the Valentine’s Day spirit. After getting out all the ingredients and reading all the instructions that came with the Pro Pancake molds (Yes, all of them. I like to know what I’m doing before I get started.) we finally got to work. I was determined to get it right the first time! At first I thought they were made of plastic. 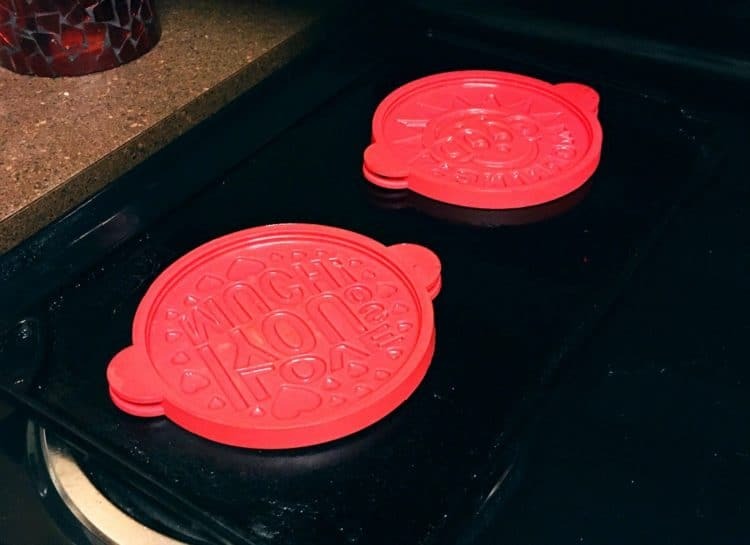 I was a little concerned (“Are they going to melt on the griddle? ?” -Me to James as if he’d used them before.) until I realized they were made of silicone. Ha! Duh. Silicone still blows my mind. You’d think a material so soft and rubbery would melt on the stove or in the dishwasher. Nope. You’ll need to first rinse off the molds in warm water while you preheat your griddle (or pan) to 350 degrees. Place the mold on the griddle (flat side down) and let it dry completely. This will also heat up the mold for when you’re ready to cook! Honestly, I think you’d be safe using almost any pancake recipe for these pancakes. I love fluffy ones, so I tend to lean toward those kind of recipes. When we first made ours, though, we used Bisquick. But the second time around, we used the pancake recipe that actually came with the instructions. Whisk all the ingredients together and get ready to cook! First, you need to fill the molds with batter. The instructions say to use about 1/4 cup to fill the mold up to the fill line, but to get fluffier pancakes I used about 1/3 cup. 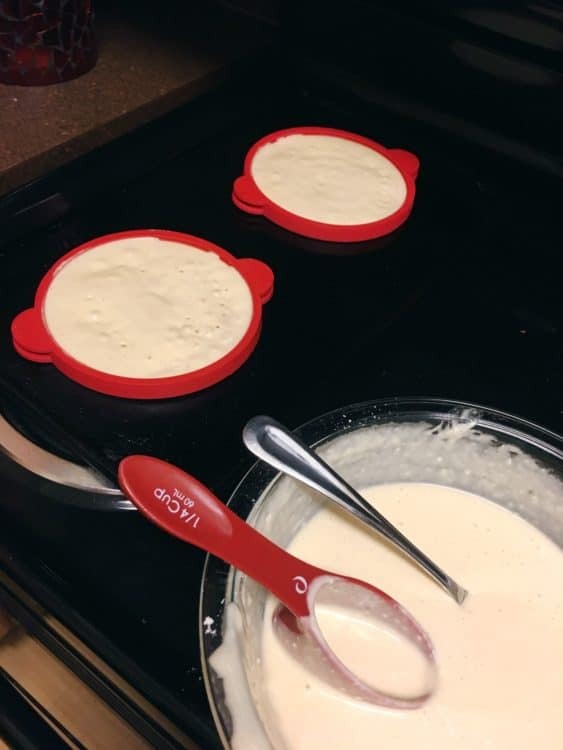 Make sure to use your measuring cup or a spoon to spread out the batter so it covers the whole template. They say don’t fill them past the fill line and don’t try to fill it to the top, because your batter will rise. I found it easiest to just fill the pancake molds while they’re on the griddle. No sense in trying to pick it up and move it before the batter’s cooked! The instructions say to cook this side for 8-10 minutes. I waited until there were bubbles forming (like normal) and it looked just a little dry. Now flip it with a spatula! Once you flip, you can pull off the mold. Grab the tab (it says with tongs or a fork, but I just used my fingers) and gently pull off the mold. Let this side cook for about 2 minutes. 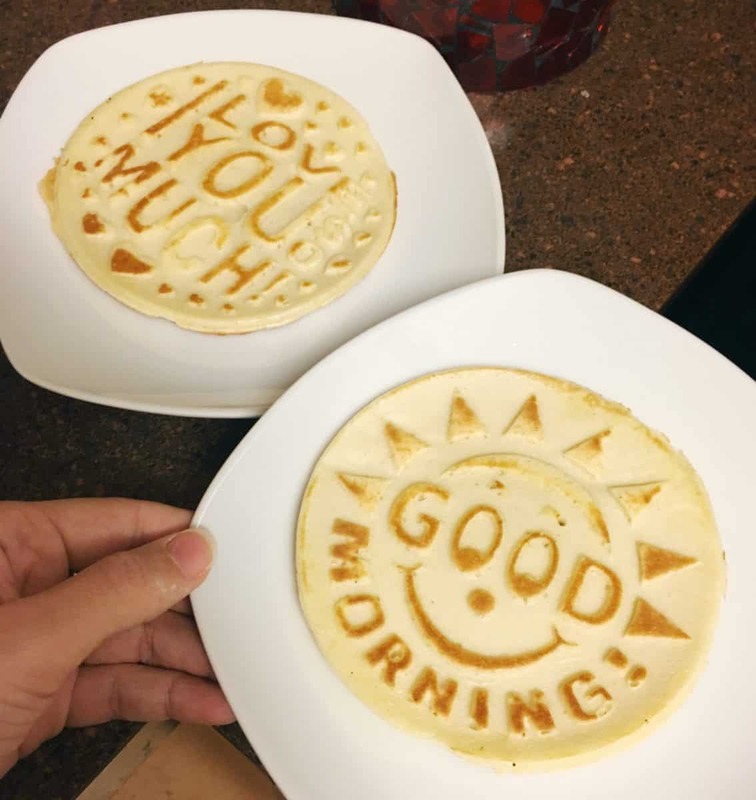 To get a nice golden design, flip the pancake one more time so the pretty face is down. Leave it for 15-45 seconds so it gets nice and golden. Serve them with butter (Earth balance vegan butter is my fave) and syrup. Just in case you’re wondering, to wash the pancake molds I tried sticking them in the dishwasher, and they were totally fine! I didn’t find anything on the instructions about how to wash them, so it was a gamble sticking them in there. I used the top rack, of course. So from my experience, they’re totally dishwasher safe. All in all, I would totally recommend the Pro Pancake Molds to a friend. They’re super cute, and very easy to use. Plus, you make perfect circle pancakes every time, which is awesome when you want breakfast to look perfect. Ha! Get them for yourself on www.PancakesPresents.com. Thank you for the review! I enjoyed seeing how the process worked for you! Hey! What a cool recipe. We don’t celebrate this holiday but I still try to do something sweet to my children. I will definitely take it to the account. How do you celebrate the 14th February?